Thousands of stories could be written about the tragic disaster that is 9/11. This book, "A Widow's Walk", is just one of them. It's by the brave widow of firefighter Dave Fontana, from Squad 1 in Brooklyn. 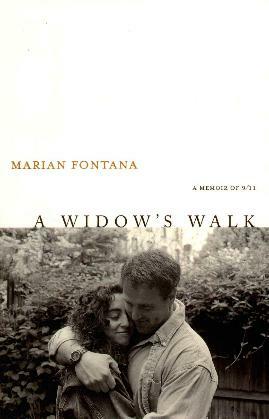 Marian Fontana and her son Aidan are just two left to carry on their lives in the aftermath of what shocked the world, and still does, that early fall morning. Marian relates her account of what happened on September the eleventh in a chilling reminder of the devastation that occured both at the World Trade Center and in the hearts and homes of those who waited for word of their loved ones. She writes about the unimagineable grief she had to deal with and how to try and accept what happened. Her little son too, has to be considered, which is heartbreaking to read about. Fortunately she has a devoted sister and friends who are with her during and after her acceptance of her beloved husband's death. She relates all the funerals and wakes they go to, the widows and Marian, the functions that are put on for them, as well as Dave's funeral. It's a heartbreaking account of having to continue living while all around you is sadness and devastating grief, being constantly reminded of the pain on a daily basis, seeing other widows, attending meetings, and get togethers. Conclusion - A well written and lovely but sad story. "Thank you Adrienne for the empathic and positive review. While the book is sad, I hope what resounds is its humor and hope. For me, the book was not just about remembering the horror, but documenting the profound unity and love that existed in its aftermath. What a wonderful website. Thank you for your support and for including me in it! All the best, Marian Fontana."